We get the job done right the first time with quality that is sure to please! B & E Roofing and Remodeling Company has served thousands of customers in Lancaster, York, Berks, Chester and surrounding counties. If your next home improvement project includes a new roof, siding, windows and doors, or an addition our home remodeling contractors are here to help. We are fully insured home improvement contractors and guarantee our work. Mark, the owner, will personally visit your home or business and gladly provide FREE ESTIMATES! Our home remodeling company is capable of doing the big or small jobs. Whether it's a trim repair, a few replacement windows or an entire home exterior or addition, we will give you a quote that is both reasonable and accurate! 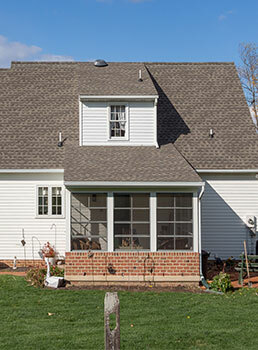 Whether your home improvement project requires windows, doors, siding, roofing or an addition we will have the right solution for you in Reading, Lancaster and the surrounding areas. Over the years we have produced a large base of many satisfied customers who have done home remodeling business with us in roofing, siding, windows and doors, etc. When you see our logo at a work site you can rest assured that we are providing the right product, the right service and the right style to fit your needs. We appreciate your business and look forward to being able to provide you with the perfect home remodeling solution for your house or business in Lancaster, York, Harrisburg, Northern Maryland and the surrounding counties! Learn more about B & E Roofing and Remodeling Company or contact us today for a free estimate on your next business or home improvement project. We specialize in metal roofing and GAF shingles. We are a GAF Master Elite certified installer. Specializing in Simonton and Harvey vinyl or wood and Anderson vinyl or wood windows and patio doors and Masonite or Therma-Tru fiberglass entry doors. We offer room additions, bathroom renovations with optional design specialist, basement finishing, interior trim work and other interior renovations in Lancaster County and surrounding areas.